Teams such as Jocelyn Peterman/Brett Gallant, Laura Walker/Kirk Muyres, Jennifer Jones/Brent Laing and Jolene Campbell/John Morris are exactly where most expect them – at the top of the standings. But with 12 of the 32 teams making the playoffs, there’s still some room for up-and-coming teams to lock a spot in Saturday’s playoff games. British Columbia’s Catera Park and Cody Tanaka are a pair that have done just that. With a 4-1 record, they’ve doubled their original win-total goal and are now tied for first in Pool A with the likes of Peterman/Gallant and Tyler Tardi/Dezaray Hawes. 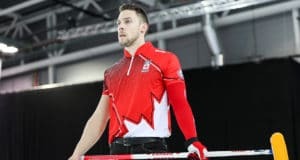 The duo had a big day on Thursday, first defeating Tardi – the reigning world and Canadian junior champion – with his partner Hawes 9-7, followed by besting the Saskatchewan duo of 2017 Canadian junior champion Kristen Streifel and 2015 Tim Hortons Brier bronze-medallist Steve Laycock 8-4. Park and Tanaka left the ice feeling a big dose of pride, with a side of relief. A score of four in the fifth end, followed by single steals in the sixth and seventh ends were enough to elevate Park and Tanaka to victory in the afternoon against Streifel/Laycock. It also gave them the confidence to remain competitive as teams battle it out for playoff positioning. One of the most important things they can do, according to them, is to remain focused and treat their upcoming round-robin games just like any other. “It makes us feel good to know we’re in every game and just because some of these players are on the tour doesn’t mean anything. They’re just another team we’re trying to beat,” Tanaka said. The fickle disposition of mixed doubles curling means the results can be decided by big moments in a game. Teams leading can quickly lose control of the reigns due to a few errors that are capitalized on. Park and Tanaka are feeling good about their ability to remain neck-and-neck with many of these teams and continue making the big shot when needed. “We were talking about how it takes three or four key shots that can change the outcome,” Park said. While the duo are new to the national mixed doubles championship though they’re not strangers to representing British Columbia. They both played for British Columbia at the 2019 Canadian Mixed Curling Championship. 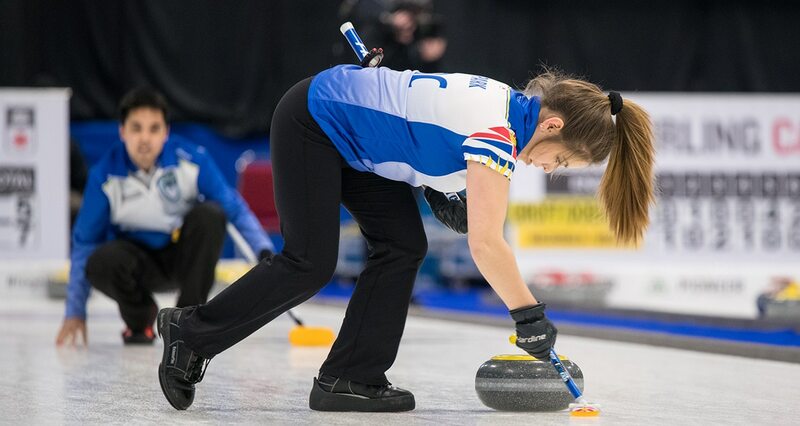 Tanaka threw fourth stones for the province, and won gold, at the 2019 Travellers Curling Club Championships, while Park has played at four different championships for the province; the aforementioned mixed and mixed doubles nationals, along with the 2018 New Holland Canadian Juniors and the U-18 Optimist Curling Championship. Park and Tanaka complete the round robin on Friday with two games. First they’ll take on Allison Griffin and Ed MacDonald from Nunavut at 10 a.m. (all time AST), followed by Winnipeg’s Ashley Groff/Kyle Doering at 4 p.m. The top team from each of the four pools advances to the quarter-finals, while the remaining eight teams with the best records will play in elimination games to qualify for a spot in the quarters. Should Park and Tanaka advance to the weekend, they’ll be facing some stiff competition against some of the biggest names in curling. “These are the kinds of people that I grew up admiring and knowing we’re playing right beside them it’s quite an honour,” Tanaka said. Shannon Birchard and Catlin Schneider remain atop Pool B with a perfect 5-0 record. Walker/Muyres had an opportunity to remain at the top of pool too, but succumbed to New Brunswick’s Leah Thompson/Charlie Sullivan 9-6 on Thursday afternoon. In Pool C, Nancy Martin and Tyrel Griffith served Kadriana Sahaidak and Colton Lott their first loss of the tournament, however they dropped to 4-1 after losing to Quebec’s Sophie and Pierre-Luc Morissette in the evening. 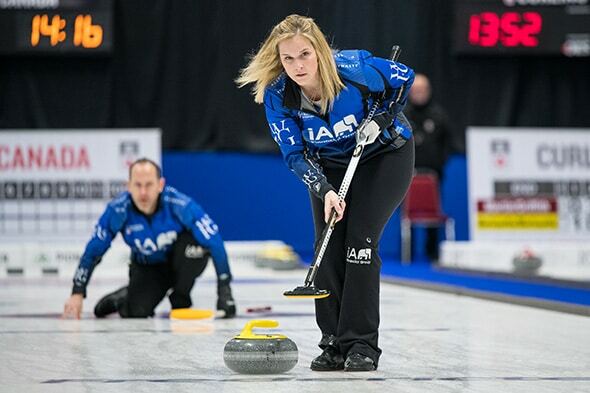 Jones/Laing remain the only unbeaten team with a 5-0 record after serving losses to Newfoundland and Labrador’s Jenna Harvey/Dave Thomas and Saskatchewan’s Jill deGooijer/Garret Springer on Thursday. 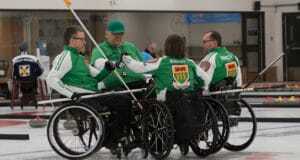 Olympic mixed doubles champion Morris and his partner Campbell lead the way in Pool D with a 5-0 record. They grinded out a 7-5 come-from-behind win against Northern Ontario’s Kira Brunton and Tom Leonard, followed by a 10-3 victory against Prince Edward Island’s Rachel O’Connor and Ryan Abraham. The round robin will be complete on Friday after games at 10 a.m., 1 p.m., 4 p.m. and 7 p.m.